Alyssa Datu and Patricia Bonilla from Team Sharon sings ‘Sana’y Wala Ng Wakas’ on The Voice Teens Philippines Battles on Sunday, June 18, 2017. “For this battle round I’m picking Alyssa,” said Lea. “Excellent performance and it’s pretty even,” said coach Bamboo. “Alyssa has a simple style, Patricia is a belter,” said coach Sharon. 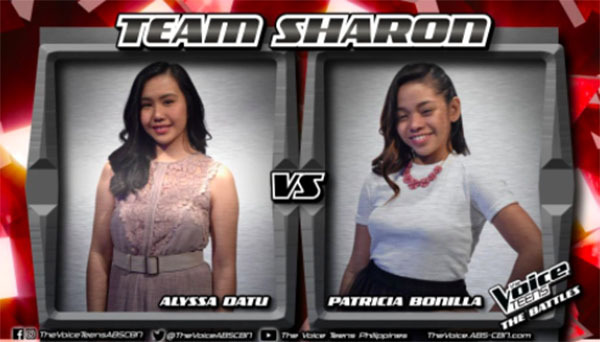 Team Sharon's Alyssa at Patricia to sing "Sana'y Wala Nang Wakas"